For many years Jose Ruiz has had difficulty eating spicy foods. Each time he eats something spicy, he suffers from severe heartburn. “You get used to it after a while,” he said. Jose suffers from chronic pain syndrome and takes pain medication for it, leaving him unaware of the ulcers that were forming inside his body. When he began to cough up blood, he realized he needed help. 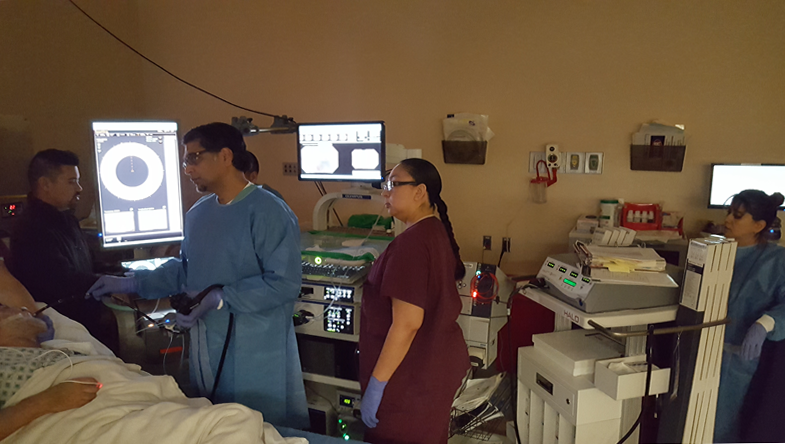 Jose went to see his primary care physician and was immediately referred to UMC’s Center for Diagnostic and Advanced Endoscopy and was diagnosed with Barrett’s Esophagus, a serious disease. Jose condition is in the last stages. Jose is a classic example of an endoscopic patient whose condition is in a large area of the esophagus. Physicians typically cannot identify subtle changes during a regular endoscopy procedure. A revolutionary endoscopic procedure has been funded by UMC Foundation. It is the Nvision VLE Imaging System and costs $182,000. It provides UMC gastroenterologists with leading edge procedure abilities. It is only available in El Paso at University Medical Center. “Thanks to UMC Foundation,” said Dr. Patel, “this new technology is a tool that uses a catheter based balloon that we insert in the esophagus and using the laser beam gives us this very high resolution picture of the lining of the esophagus that allows us to actually detect pre-cancerous changes that would help us to identify these cancers earlier. This helps us to be able to biopsy them sooner and possibly remove them and cure people before the disease progresses to an incurable state,” he adds. Jose’s esophagus was found to be without pre-cancerous changes.